The two 25-yard shooting galleries that comprise GPSTC’s Pistol Range feature 26 targets each and can accommodate up to 52 shooters at a time. The pistol range also houses a weapon cleaning station. The renovated 50-yard Multi-Purpose Range features 28 target frames and a running man target system. The range accommodates the use of hand or sub guns. The 200-yard Rifle Range accommodates up to 12 rifle shooters at a time. 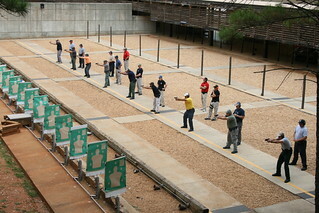 GPSTC’s Long Rifle Range is one of the only of its kind in the state. It features targets out to 550 yards. Accommodating up to six shooters at a time, the Long Rifle Range is the perfect venue for counter-sniper training. The Shotgun Range is a 50-yard range and features 44 targets that turn. GPSTC is one of only two training facilities in Georgia to teach the Reactionary Shooting concept and has a dedicated range for practicing these techniques. The Trap Shooting Range accommodates 10 shooters at a time and allows users to build the skills necessary to hit a moving target with a shotgun. In order to challenge shooters, the range equipment allows for the launch of clay targets at various speeds and directions. The Crime Scene Range is a simulated business or motel structure and also features a live fire shoot house with full ballistic capabilities and threat/non-threat scenarios. This range accommodates live fire engagements that allow for maximum realism. GPSTC’s updated Judgmental Pistol Simulator System allows students to engage in multiple real-world scenarios via interactive video. Students must determine if use of force or use of deadly force are appropriate courses of action given the particular scenario. This type of training is extremely valuable because it presents students with situations very similar to those they will encounter on the job and allows them to hone their skills and judgment in a safe environment.